A bison bull rests in pre-dawn light with a backdrop of Pikes Peak, about 100 miles distant. Bald eagles, four juveniles and one adult, loaf in a frozen cottonwood before flying to their hunting perch for the day. I lost count after seeing more than 30 bald eagles leaving the evening roost in waves. Coyote tracks lead east on a two track. The prairie seems endless from this perspective. 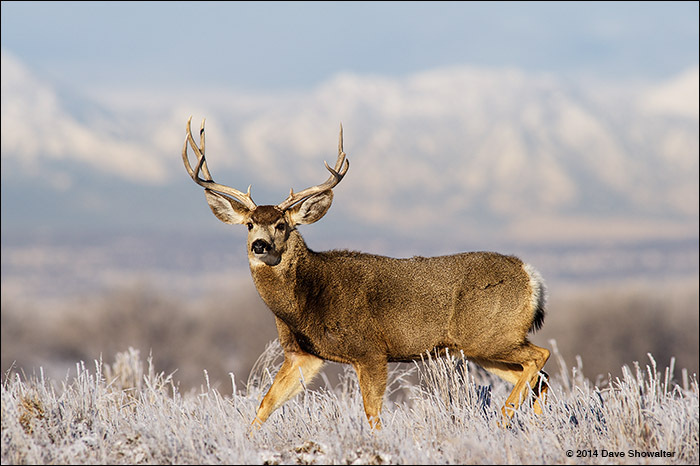 A tight bachelor group of mule deer with impressive racks! Now that I’ve moved back to Fort Collins I don’t get over to the RMA. Miss it. Nice series of photos from your morning out. Thanks, Dave! Well, Fort Collins is a great town with wonderful prairie! Wonderful images; I could smell the cold, and the sage. The bison before dawn, the lone muley looking at the camera, and the coyote tracks all grabbed me. Good to hear from you, Bob. Sounds like a full life up there and be happy is a great mantra!